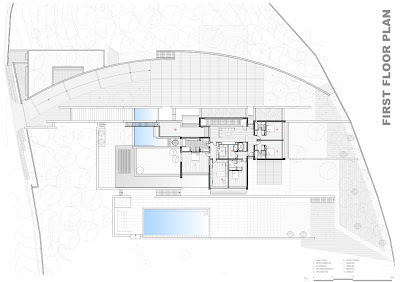 High up on Mount Lebanon, away from the hustle and bustle of Beirut, is the F House in Dahr el Sawan. 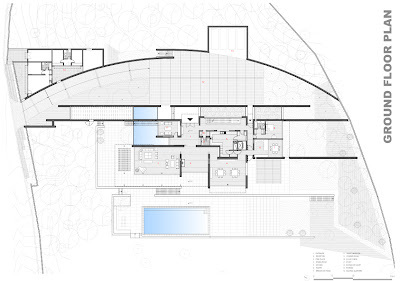 A Mediterranean masterpiece by Nabil Gholam Architecture & Planning. 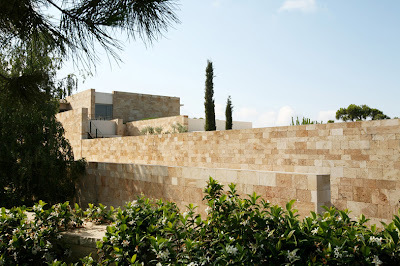 A high profile young couple with 2 children, the clients organized a competition for a new family residence to live and entertain in as their home in Lebanon. The general program consisted of 5 en-suite bedrooms for family and guests, generous indoors and outdoors living, dining, and recreation areas to complement the couple's social lifestyle, plus the usual amenities. 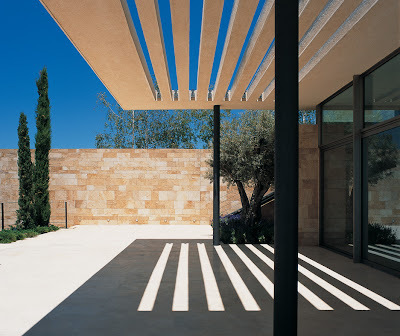 The brief was much less straightforward: while the aim was to have a modern Mediterranean house (“not organic, not monolithic”), the couple brought two very different stylistic expectations into it. 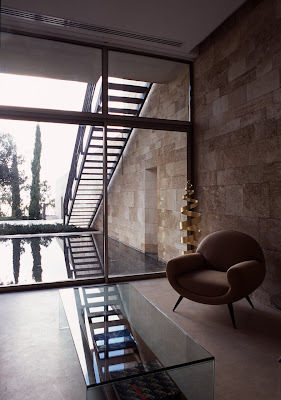 He grew up in a family that had been living in modern architecture (including houses by Mallet-Stevens and Niemeyer) since the 1960s, in Lebanon, Europe and the USA, and had a preference for its clean lines and austerity. She came from a background in the hotel and tourism industry, and had a more romantic vision of ornate and plush luxury she recognized in vernacular oriental architectures. 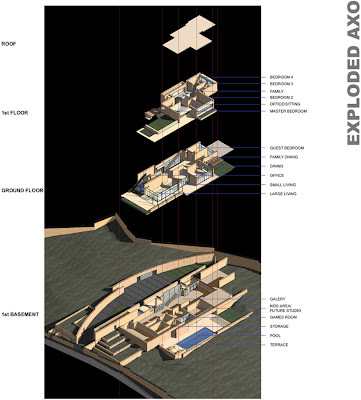 In addition to these two seemingly contrary visions that risked making the client-architect relationship a tougher challenge, the clients requested that their house, despite the size of the program, should exude a sense of discretion, and not act as a superfluous social statement of wealth. 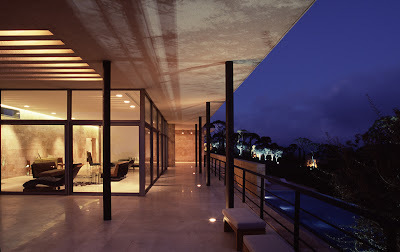 The site of 11 000m2 sits on a sumptuous pine-covered hilltop, 1200m above sea-level on Mount Lebanon, commanding extraordinary vistas in all directions. The location has excellent year round Mediterranean climate: relatively warm and dry and easily accessible in winter even in occasional snow, breezy and cool in the summer. 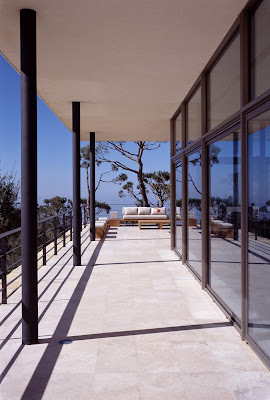 The strong slope of the land provided many challenges - to set the residence in harmony with the hill, harness the rising sea breezes, the views and the open skies, while keeping a flexible layout, all in an architectural style that is at one with the surrounding nature. 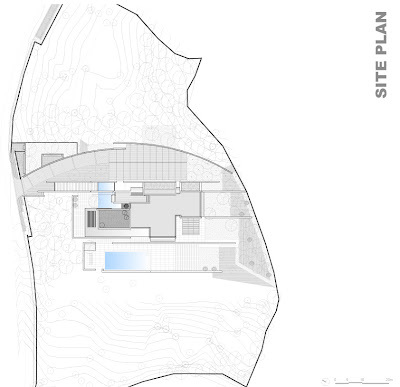 An ecological outlook respecting the site and a use of local materials throughout. 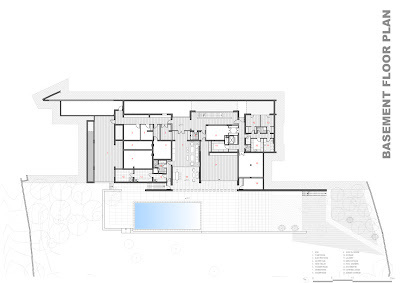 A simple, legible massing language that belies a rich collection of spatial experiences and framed views. A powerful and seamless integration between the inner (architectural) and outer (landscape) realms, with a subtle delineation of public (social) and private (family) realms. A sweeping arched retainer wall holds back the hilltop, allowing a series of orthogonal local sandstone walls to spring out from the land. 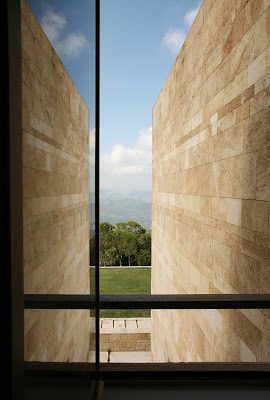 Cascading down the site, they direct the gaze and frame views of the blue sky, the lush pine forest, the snow-capped mountains, and the eternal horizon of the Mediterranean Sea. From the highest point of the hill, they read as archaeological traces of a timeless structure sunk in a field of indigenous flora. 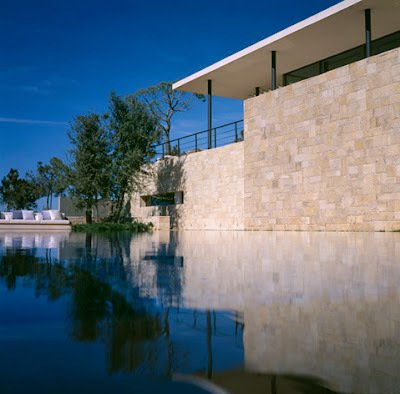 Horizontal planes of cross-cut travertine slabs, cool reflecting water ponds, and cantilevered canopies intersect the walls in dialogue with the slope, generating the living spaces of the house. 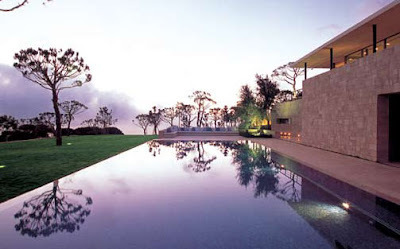 Careful orientation and sun shading, fifth-façade planted roofs, crawling greenery and obsessive attention to proportion help the house to sink considerately into the hill and respect its ecology (trees were carefully protected and only indigenous species were added). Yet the choices and expressions of material reveal that these walls are very much man-made: a rational layering of horizontal joints overlaps the ashlar construction of the main sandstone walls, which act like horizontal incisions in the landscape. 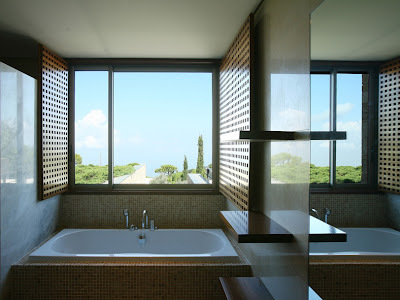 Effectively, the house has two faces it offers to the world. 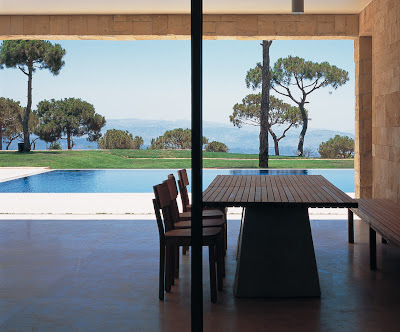 The first it presents to the visitor is a mute succession of stone walls with occasional vertical slits and trees peeking from behind, hinting furtively at the private world beyond. It is a facade that plays hide and seek, creating a sense of subtle mystery that enhances the clients' desire for discretion while expressing a calm opulence and a safe haven for the family. Passing through these first layers of filters, one goes through a succession of quiet spaces, mirrored by shallow reflecting pools and open to the sky, but already shielded from the hills around. 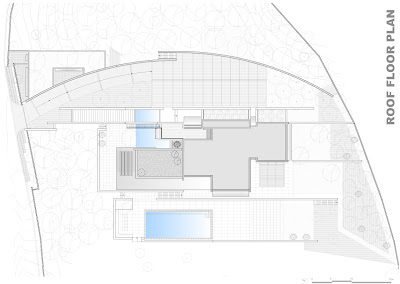 The second face is more private, yet fully glazed to allow a complete communion between house and nature: the bedrooms open to the views on the upper floor; the gym, pool house, service and playrooms are arranged around the courtyards of the semi-enclosed basement. All are cross ventilated capturing the sea breeze rising from the valley. 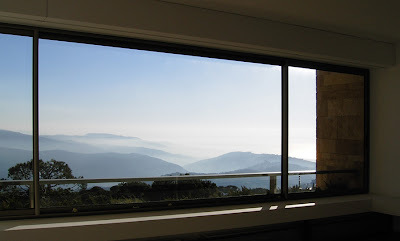 From within, the views framing the pine woods and the valleys beyond are gradually unveiled and broadened, eventually opening fully to great vistas to the sea. Light and air cross freely through the living spaces. 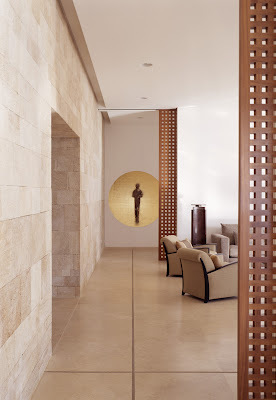 The passage through the house at ground level is an almost ceremonial procession from a public to a private realm. 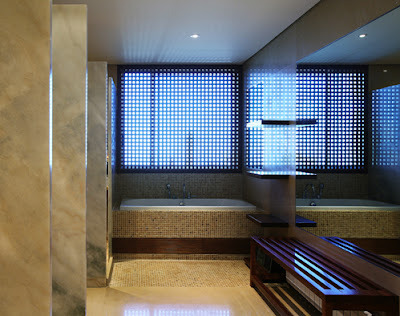 The resultant architecture was made possible through a sustained enthusiasm and a very personal involvement in the process on our end, building the clients' confidence as the project took shape. 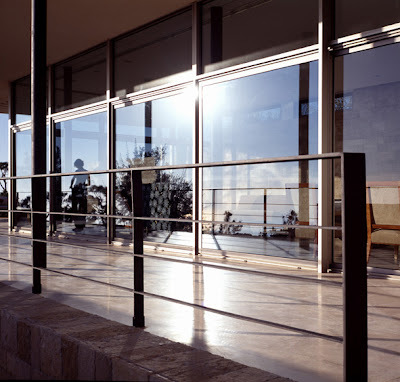 The solid friendship and appreciation that developed between the clients and the architect by the time the house was completed was also helped by the strict respect of the original budget, and the reunion of the couple around what turned out to be a fully consensual design vision.